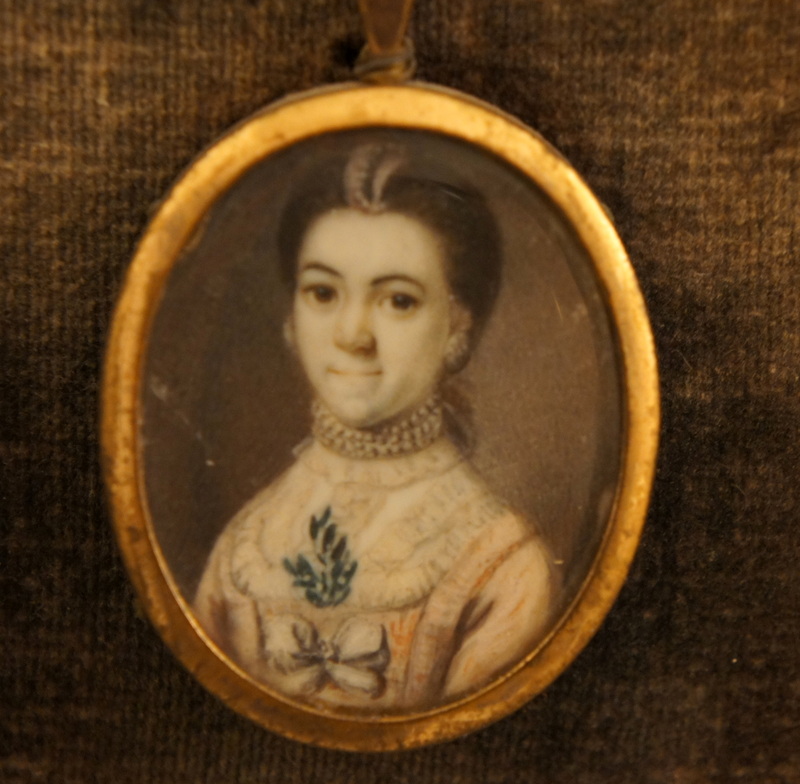 Ann Street was born April 8th, 1733, the daughter of James Street, an eminent apothecary of Bath. Her brother William later became the mayor of Bath. On March 17th, 1754 at Bedminster, Somerset Ann married the actor, William Dancer who, by all accounts appears to have been the most unpleasant of men. 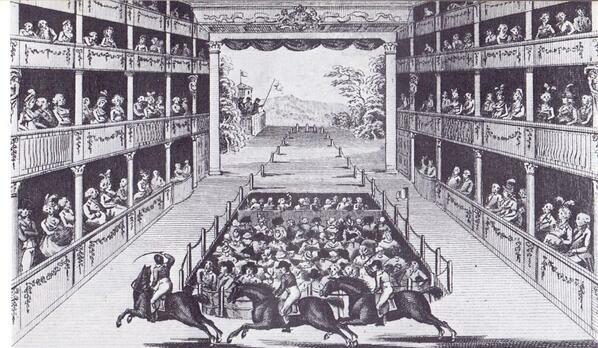 The couple performed on stage in London around 1758, where Ann became the doyenne of the tragedies. 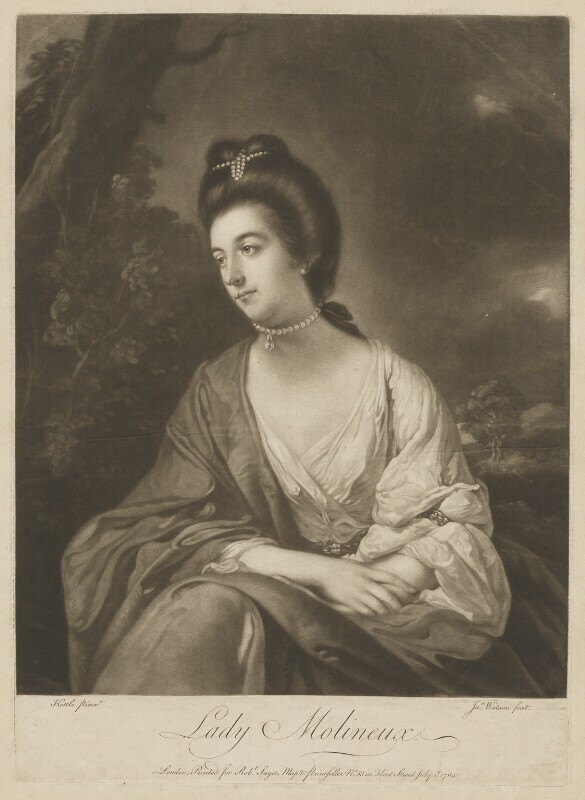 This marriage was short-lived as in 1759 Dancer died, leaving Ann a mere 26-year-old widow, but as she was already having a close relationship with a fellow actor, the renowned Spranger Barry she sought solace in his arms. 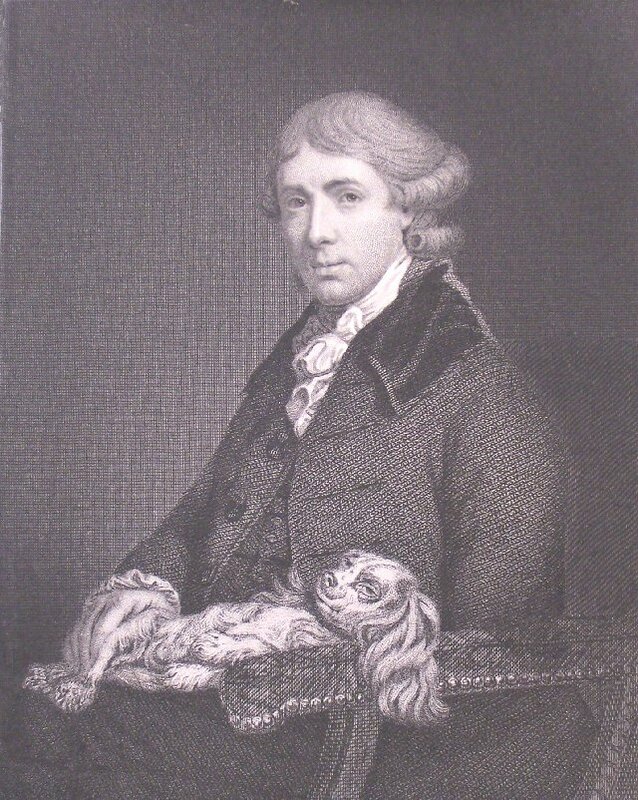 Barry, born 1719, was an Irish actor, who had originally been trained by his father as a silversmith but was said to be a descendant of Lord Santry. Certainly, he lived like a lord. He married a woman who bought with her a £15,000 dowry, so life was good. The problem was that he spent money like water and became bankrupt very quickly. So, with an interest in the theatre, he took to the stage, to earn more money. Barry first performed at Smock Alley, Ireland and was affectionately known as the ‘silver-tongued actor’ and rapidly became regarded as a brilliant actor. 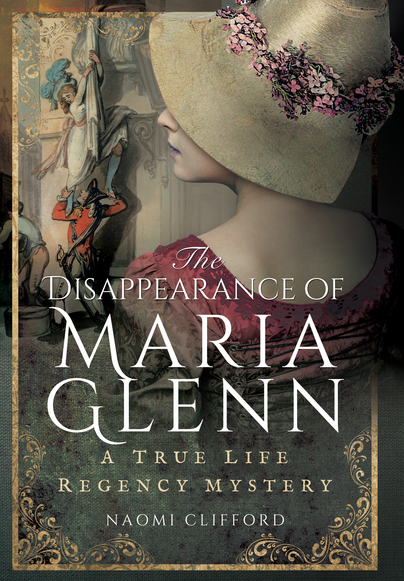 The couple met whilst working in Dublin and began an affair prior to the death of Ann’s first husband, then after his death, they decided to move to the bright lights of London where Barry had worked previously. The couple continued their stage work performing on the stage at Drury Lane, then Covent Garden. 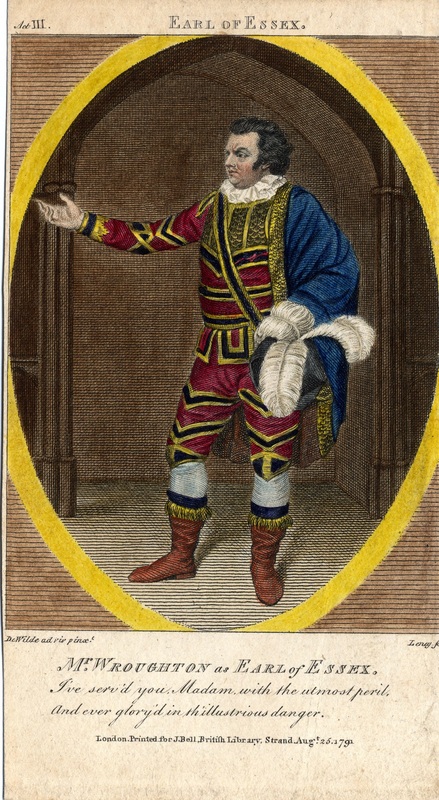 On January 10th, 1777 Barry died at their home in Cecil Street and was buried in the cloisters at Westminster Abbey, but his rival throughout his career, Garrick was buried inside! He did, however, leave Ann a well provided for widow. She was named in his will as the sole beneficiary of his not insignificant estate. He left her a house in Streatham, Surrey, leasehold plus the Theatre Royal, Crow St, Dublin along with a property adjoining it. Having written his will he did however lease the Dublin theatre to a Thomas Ryder, so quite how much Ann benefitted from this legacy we do not know for sure, but in a letter written by John Ord (barrister), in ‘Letters Addressed to Mrs Bellamy occasioned by her Apology’ it would seem that Ann’s solicitor advised John Ord, that Mr Barry had died insolvent, and that the theatre in Dublin would not pay the creditors there. 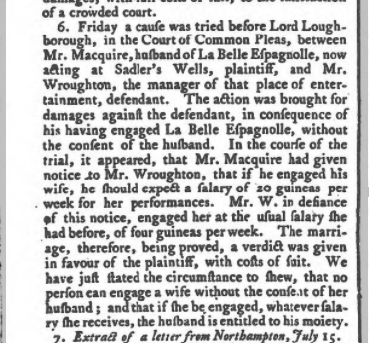 ‘kept out of the process of the Court of Chancery; and though Mrs Crawford performs at Covent Garden, her person is safe, having made her husband the scapegoat’. Quite how and when Ann met husband number three we can’t work out and there is no sign of a marriage for the couple, but a variety of documents confirm that they were a couple, so it seems feasible that they were married in Ireland. Ann’s final performance on the stage was in mid- April 1798 at the Theatre Royal, Covent Garden and some two years later she died, on November 29th, 1801, at her apartments in Queen Street, Westminster. Ann was buried alongside her second and apparently favourite husband, Spranger Barry in Westminster Abbey having outlived her third husband. 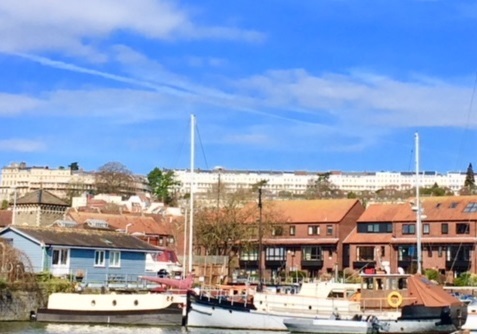 Many people immediately think of places such as Bath, Harrogate and Cheltenham when thinking about iconic eighteenth-century towns and cities, but Bristol still retains much of its Georgian era heritage. Following a trip to the city recently we thought it would be interesting to take a look at some of the old buildings. Bristol stands on the river Avon and is spanned by the Clifton Suspension Bridge, which opened in 1864, but was based on a design by Isambard Kingdom Brunel in 1753 as a means of crossing the Avon Gorge and the design was contributed to by the inventor, Sarah Guppy. 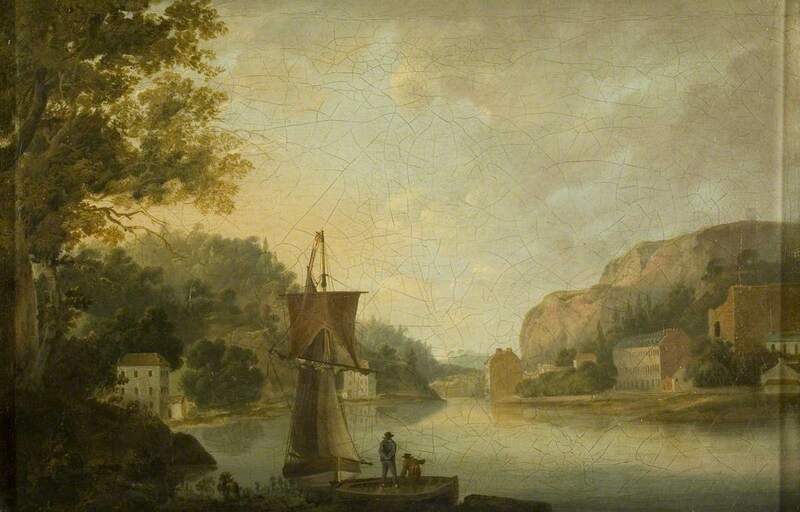 View of the Avon and Hotwells Showing the Foundations for Windsor Terrace by Thomas Leeso Rowbotham; Bristol Museums, Galleries & Archives. 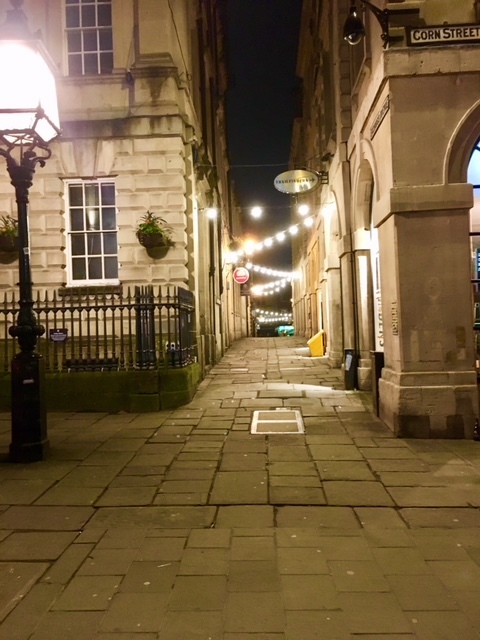 Bristol was well-known as a centre for trade and was the second largest port until the mid-eighteenth century when Liverpool took over the position as it had more capacity. Bristol’s main trades were in sugar, coffee, tobacco and chocolate which were produced in the Caribbean by the slave trade. 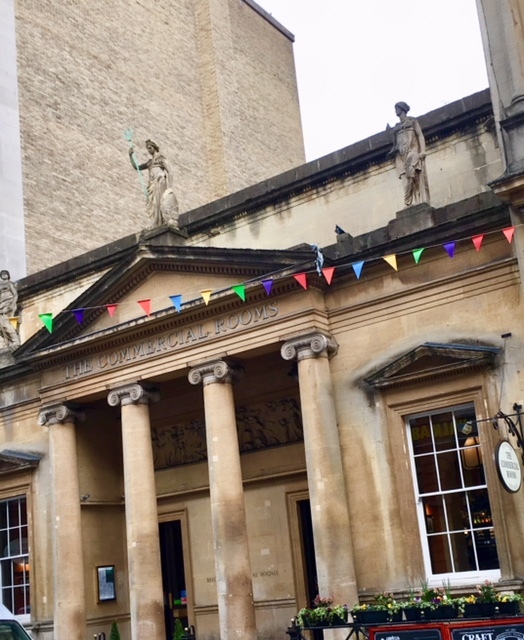 One of the main streets in Bristol that has survived largely intact is that of Corn Street, which now accommodates banks, shops, restaurants and an indoor market, known as St Nicholas Market. 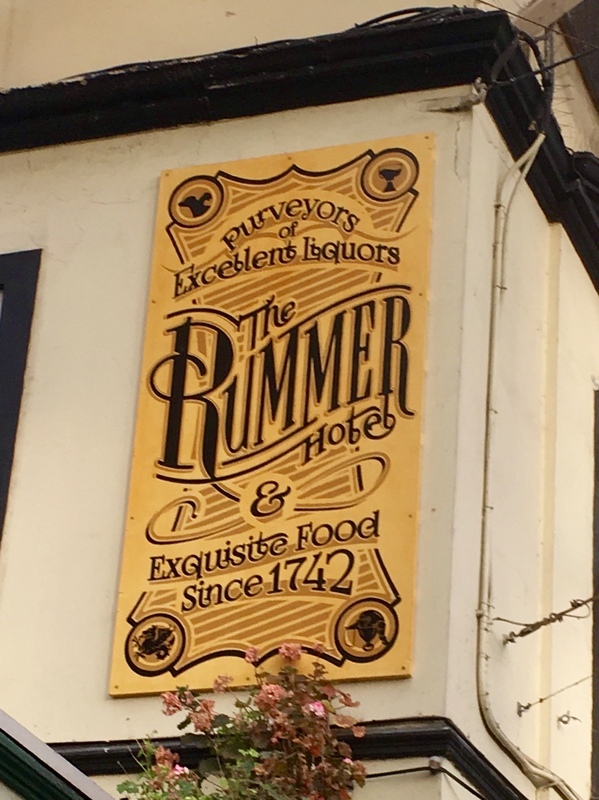 Within the market itself, there is an old pub, known as the Rummer, which has stood there since 1742 and is still open today. The building had side structures with two storeys of shops and offices which were used by insurance dealers. One of these became the Corn Exchange and was formally opened on 18th October 1813. On Monday last the new established Corn Market in the Exchange, Bristol was regularly opened. The boxes in which samples are exhibited upon the plan of Mark Lane, London, form a line on the south side. Considerable business was transacted; and no doubt great benefit will be derived from the establishment. The market days are Monday and Thursday. A very respectable party dined together at the Rummer Tavern, after business was over to celebrate the opening. The Corn Exchange building which leads into the markets was built around 1740, by John Wood the Elder. Outside the building are four pillars, known as ‘the nails’. The oldest pillar is reputed to date back to the end of the Elizabethan era. The second oldest was given by Bristol merchant Robert Kitchen, who died in 1594. The other two are dated 1625 and 1631. 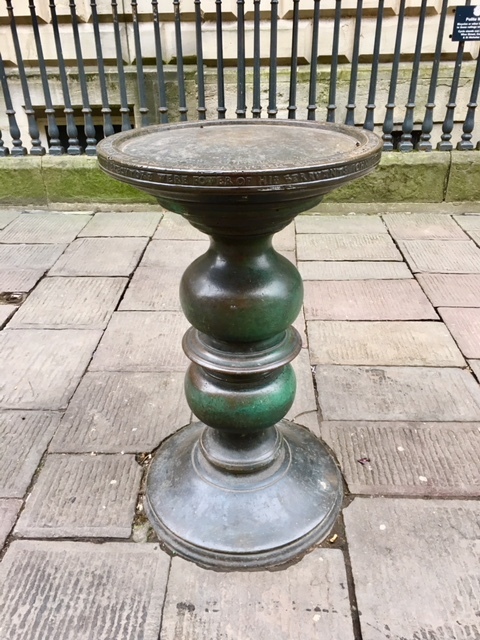 On top of the pillars were ‘containers’ with slightly raised edges which were used by merchants, the money would be placed inside the container without risk of it falling out. It is said that the phrase ‘paying on the nail’ originates from the use of these (it’s a great story, but probably not true). 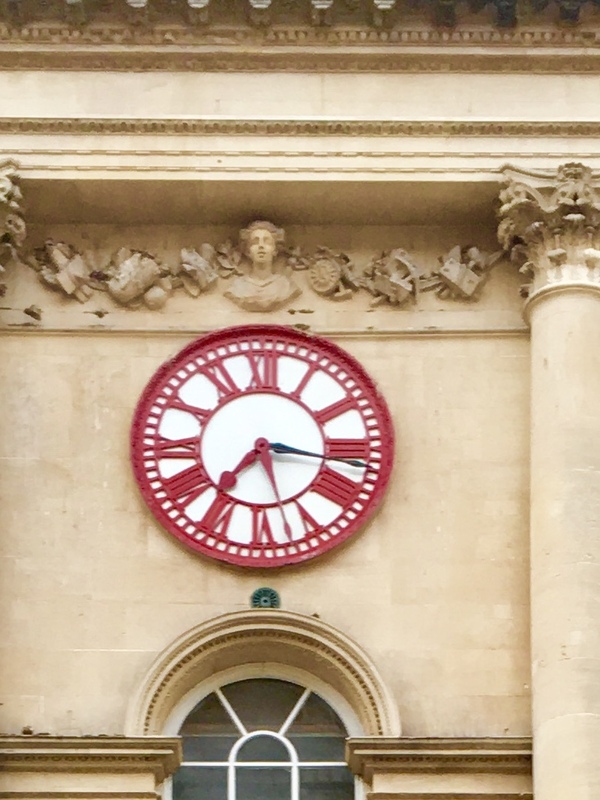 Also, on the front of the building, there is a clock, You can see from this photo that there are two ‘minute’ hands, one in red, the other black. The reason for this is that Bristol had its own time which was ten minutes slower than Greenwich Mean Time but, with the advent of the railways, it was necessary to have a standard time, i.e. GMT, but Bristol also retained its own local time. In November 1808 funds were raised to build an exclusive club for merchants to meet. The sum of £10,000 was raised within a 24-hour period, but it wasn’t until February 1810 that adverts began to appear in the newspapers for tradesmen to apply via sealed bids to carry out the work and the first stone was laid on 19th March 1810. The portico is of the Grecian Ionic order, with the three statues above personifying the City, Commerce and Navigation. 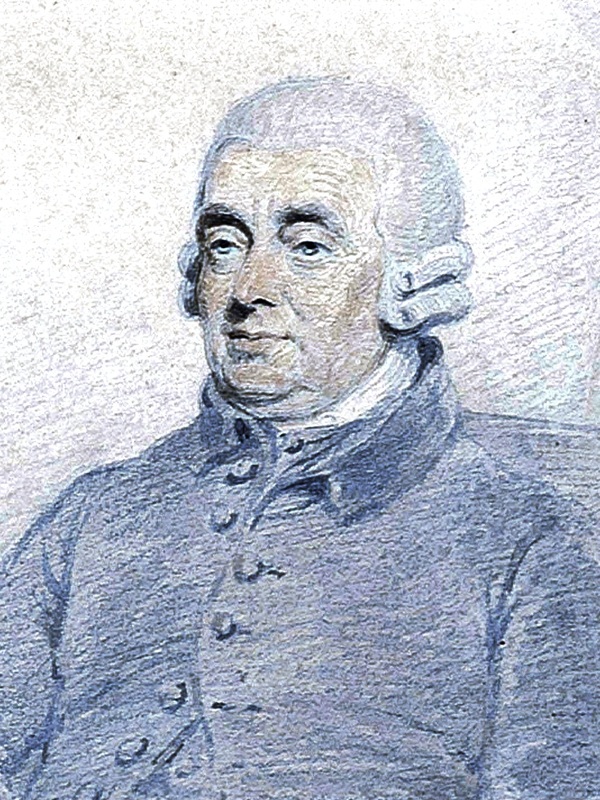 The first president of the Commercial Rooms was John Loudon McAdam, the inventor of Tarmac. Those like us who are lovers of chocolate will be pleased to know that Bristol was also renowned for its chocolate manufacture; way back in the late 1720s Joseph Fry senior invested in an apothecary, Walter Churchman who found the ideal way to produce chocolate and set up a factory, Castle Mills. So confident of his new product was Walter, that he published the technical specifications for it in the London Evening Post in 1737. Sadly ‘the great chocolate maker’s’ life was to end only 4 years later. The business was continued by his brother, Charles Churchman and in 1761 Joseph Fry and his partner John Vaughan acquired the patent for a water-powered machine which ultimately led to the establishment of the brand we know today as Fry’s chocolate. 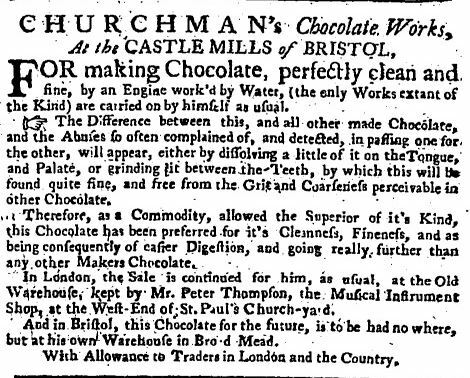 Below is an advert from 1750 for his chocolate detailing how to eat it and its benefits. 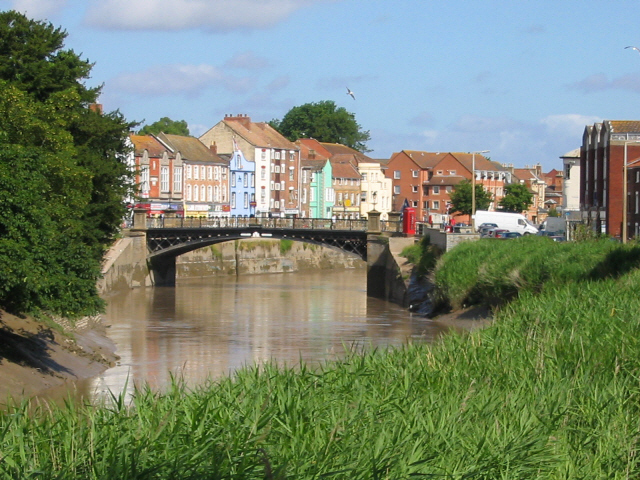 The area of Clifton stands above the city and was where the affluent of Bristol live, to avoid the squalor of the city itself in the Georgian Era. 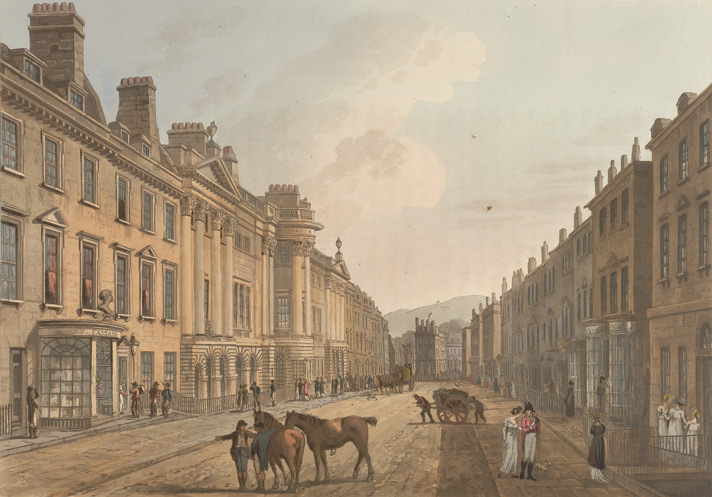 The main street was the Royal York Crescent. 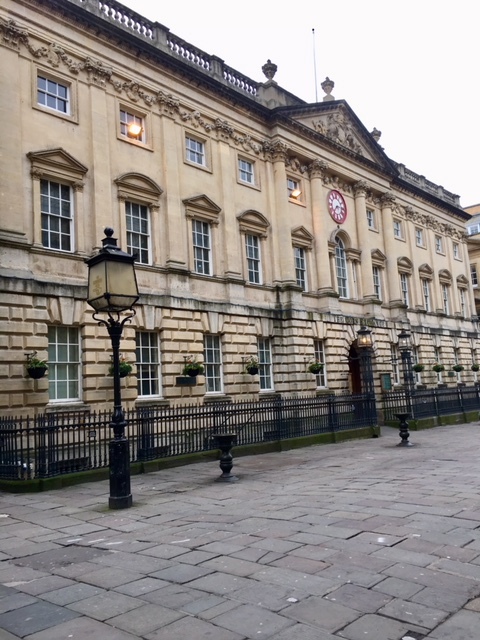 A plan, known as ‘The Bristol Tontine’ was devised on 26th December 1782 by Mr James Lockier, a merchant, to build the Crescent, consisting of 46 houses. There would be 700 shares at £100 each, after the properties were built they were to be sold making the shareholders a substantial profit. Their aspect was to be nearly due south with views of the Clifton Hill. Each house was to be 25 feet in front and 54 feet in depth. They would have drawing-room 27 feet by 23 feet, dining room 27 feet by 17 feet, with excellent lodging rooms, good offices and everything that can contribute to render them desirable dwellings for families of respectability and consequence, with a spacious terrace and shrubbery in front. It was a fascinating city to visit and far too much to see to include everything in this post, but hopefully, it gives a flavour of the city. It was amazing to see places that would have been so familiar to our Georgian Heroine who lived there in the early 1800s, both in the city itself and also at Clifton. In a previous blog post ‘Miss Jenny Davis as a bride’ we briefly mentioned Richard Wroughton, so thought we would take a closer look at him to see if we could find out anything more about his life. Little is known of Richard’s early life. He was born in Bath, Somerset the son of Charles Rotton, or Rotten as recorded in the baptism register of St James’s church, Bath, 22nd October 1749. A small entry for a man who was to become one of the leading players of the London theatre circuit. Quite why he changed his name we can only speculate, perhaps Wroughton appeared more suitable for the theatre than Rotten! It is reputed that whilst Richard was ill he fell in love with his nurse, Joanna Townley, and later married her. We know he was under 21 as the parish registers of 1769 tell us that his father needed to give his consent. There was no such entry for his bride to be, however, implying that she was older than him. Richard and Joanna left the confines of Bath so that Richard could pursue his passion for the theatre, and so they set off for the glamorous life in London. 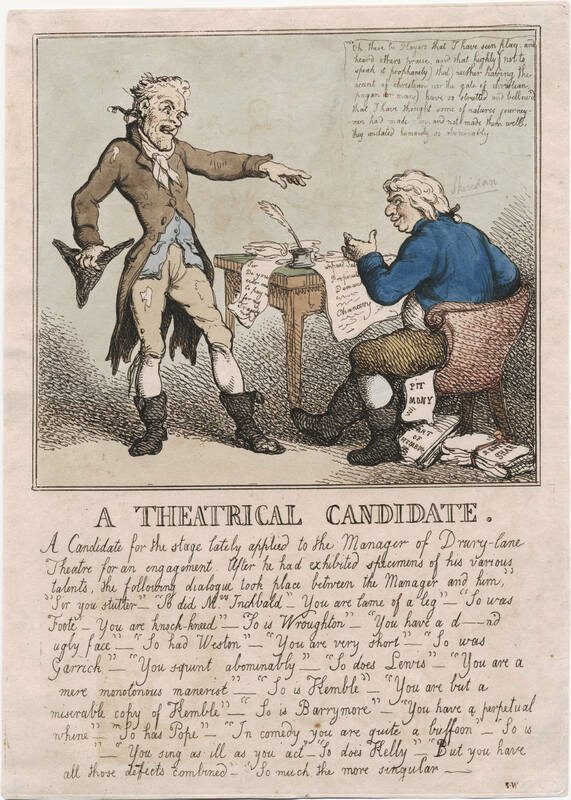 Reading about him, Richard was clearly never short of work taking on a wide variety of predominantly Shakespearian roles at both Covent Garden and Drury Lane from the late 1760s until his retirement from the stage in 1798. He also performed in Liverpool and was the manager of Sadler’s Wells. 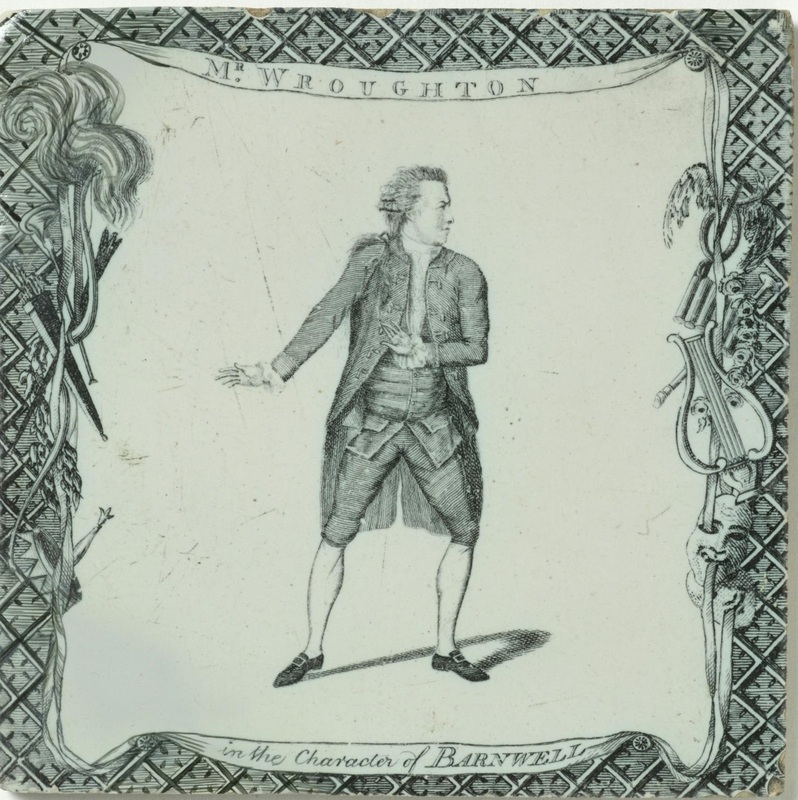 However, his ‘exit stage left’ was a little premature as he returned to acting a year or so later and remained an actor until 1815 when he finally retired, exhausted. We tracked down his will, in which he left everything to his ‘beloved wife Elizabeth’ – who? He had remarried, so we began to search for the death of his nurse, later to be his wife, Joanna and found a curious burial entry in the parish register of Speenhamland, Berkshire for the 14th November 1810, the burial of a Joanna Wroughton, her residence given as Bath, Somerset. 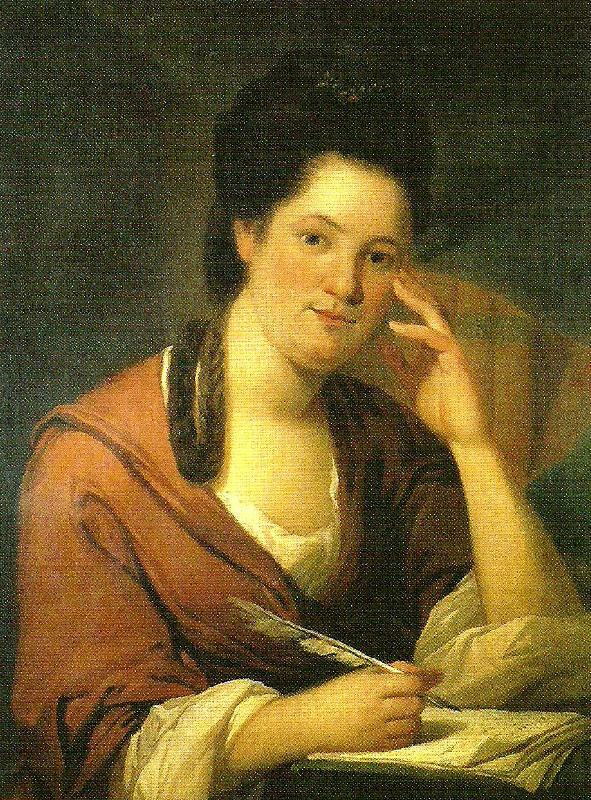 Her age at the time of her death was given as 71, making her birth 1739. Was this Richard’s wife? It would certainly appear to have been, so she was a good ten years his senior. ‘a sterling person, sound and sensible. His person was bad, he was knock-kneed, his face was round and inexpressive, and his voice was not good. He had, however, an easy and embarrassed carriage and deportment, was never offensive’. Richard was clearly a popular man as he was named as a beneficiary in several wills we have come across, most notable being that of the renowned actor Robert Baddeley. 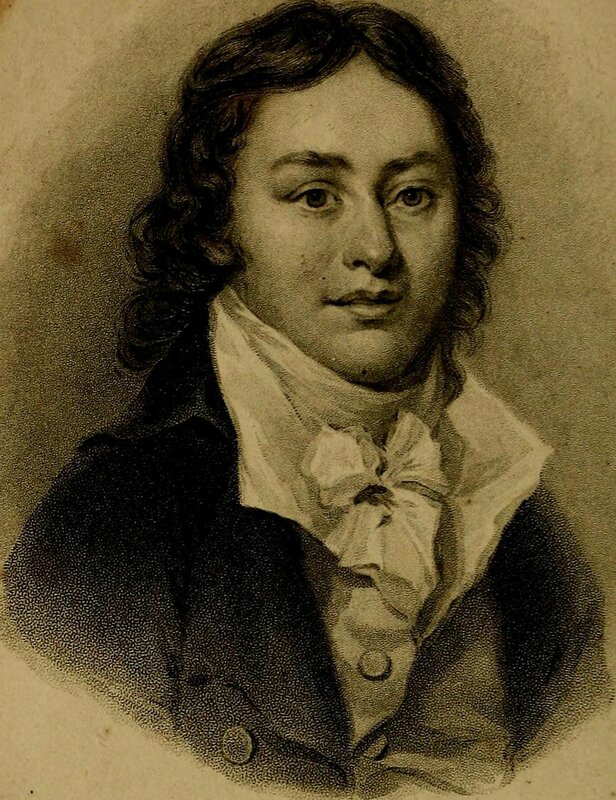 Richard was buried 22nd February 1822 at St George, Bloomsbury, Camden. We are delighted to announce a ‘sister’ site to All Things Georgian, and would like to introduce to you ‘The Diaries of Miss Fanny Chapman’ which can be accessed by clicking here. Some time ago we were approached by George and Amanda Rosenberg who had enjoyed our blog posts on this site, and thought we might like to host the diaries that they had painstakingly transcribed which were written by Fanny during the Regency, late Georgian and Victorian eras (George descends from Fanny Chapman’s family). We were both thrilled and somewhat overwhelmed when he sent us the diaries and associated information, and quickly decided that they deserved a site of their own, for they are quite wonderful to read, and we hope that others will find them as fascinating as we have done. They are still a ‘work in progress’ as George and Amanda have far more information than we have managed to pull together as yet, so please keep checking back for further developments. Christiana Fanny Chapman was born in 1775 to Henry Chapman and his wife Christiana (Kitty) nee Neate. 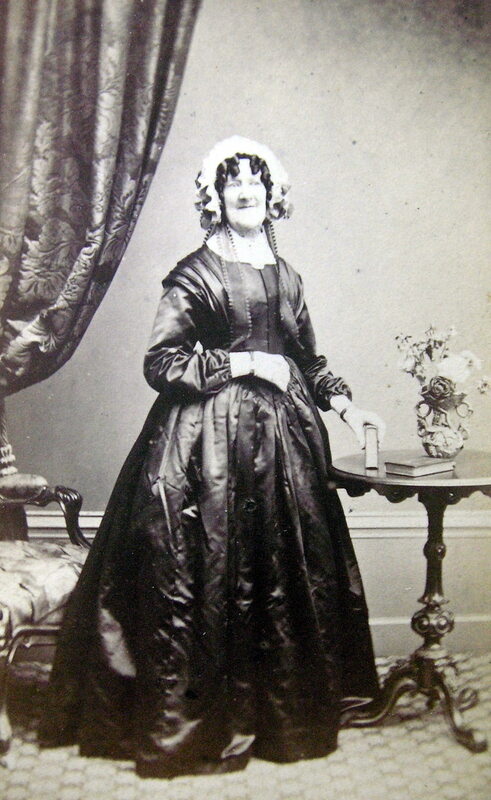 Her diaries were kept in the form of notebooks and a number of loose pages and cover the years 1807 to 1812 when she lived in and around Bath and in Somerset with her aunts Jemima Powell and Mary Neate (Mary was also Fanny’s godmother), very much dependent upon them. The diaries describe their everyday life, their circle of friends and the social routine of the minor gentry of the time. 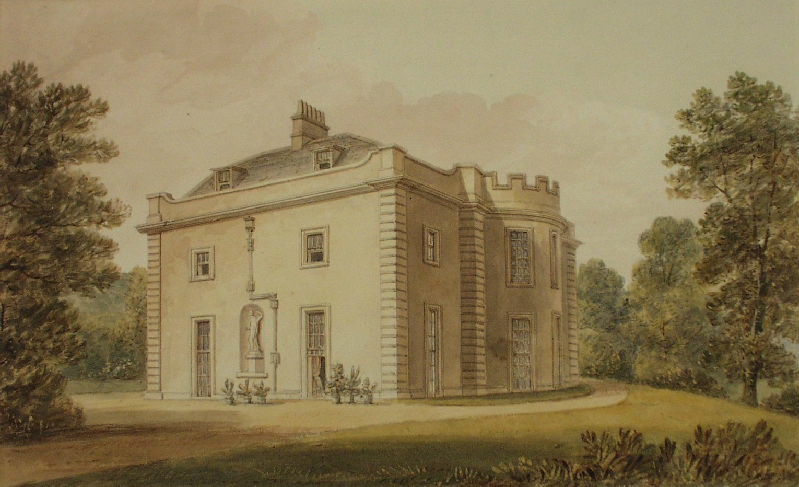 Batheaston Villa near Bath, c.1825, Fanny’s home up to 1809. 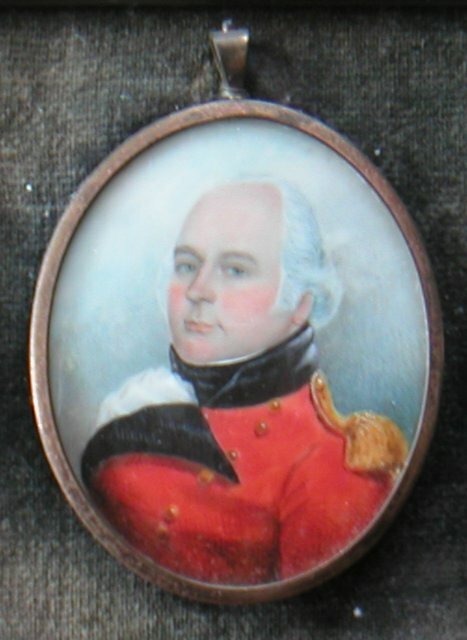 A constant presence in the diaries is Fanny’s uncle by marriage, Colonel John Hutton Cooper. He had been the second husband of Fanny’s aunt Phillis, who had been left a wealthy widow upon the death of her first husband, Charles Meniconi. When Phillis died she left everything to Cooper, including the villa in which they all lived, probably upon the understanding that he would continue to provide for her sisters and nieces (Fanny had a sister, Emma). Cooper reneged on that agreement, but George believes, and (after reading the diaries) we agree, that Fanny was more than a little in love with her widowed uncle, at least initially. Emma later described Cooper as a ‘reprobate and a fortune hunter’. Fanny’s diary ends in 1812, and then recommences in 1837, just weeks after the young Queen Victoria had ascended the throne. 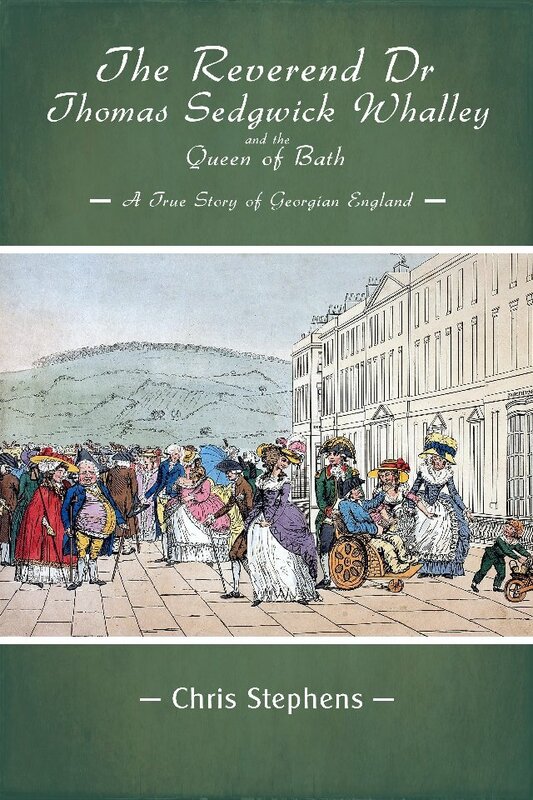 With her two aunts dead, Fanny is living in Bath with her sister, finally her own mistress. Her aunts both left Fanny the main beneficiary of their wills. Milsom Street, Bath, where Fanny lived during her later years. Whilst the diaries which cover the years 1807 to 1812 are all fully available, the ones covering the Victorian years will be added to the site shortly. 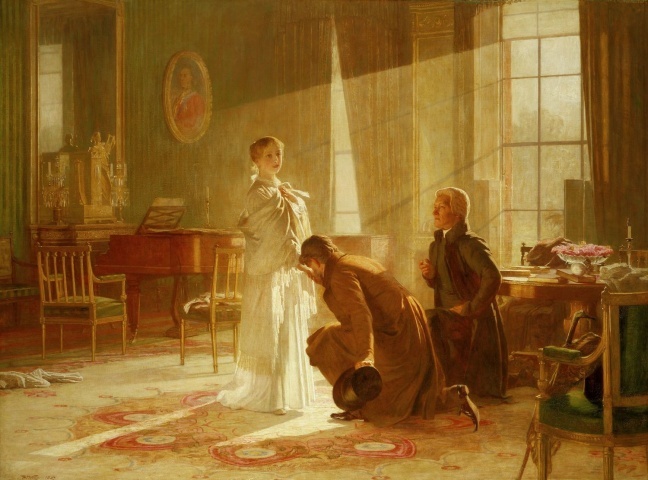 This painting depicts the moment in the early hours of the morning on Tuesday 20th June 1837 when Princess Victoria hears of her accession to the throne. The diaries end in 1841, but Fanny lived many more years, not dying until 1871 at the grand old age of ninety-five years. Please feel free to share this with anyone whom you may feel will be interested in these diaries. You may also wish to follow @ChapmanDiary on twitter. We have the immense pleasure of welcoming our first guest to the blog, none other than Professor Chris Stephens of Bristol University. He has given us the following information about himself, his excellent new book and the Reverend Dr Thomas Sedgwick Whalley. Professor Stephens retired in 2002 after 35 years in academic dentistry spent teaching orthodontics and undertaking pioneering work in the application of computers to dentistry and dental education. By this time he was also a professional dry stone waller and had helped to establish a SW England Branch of the Dry Stone walling Association of Great Britain. In 2006 Chris was asked by the Woodland Trust if he could assist them in restoring the perimeter wall of their Dolebury Warren Wood property on the north slope of the Mendips. The work, undertaken with the help of local volunteers took three years to complete during which time Chris discovered that the walls had formed part of the estate which surrounded Mendip Lodge, an Italianate house built in the late 18th century by the flamboyant Reverend Dr. Thomas Sedgwick Whalley. 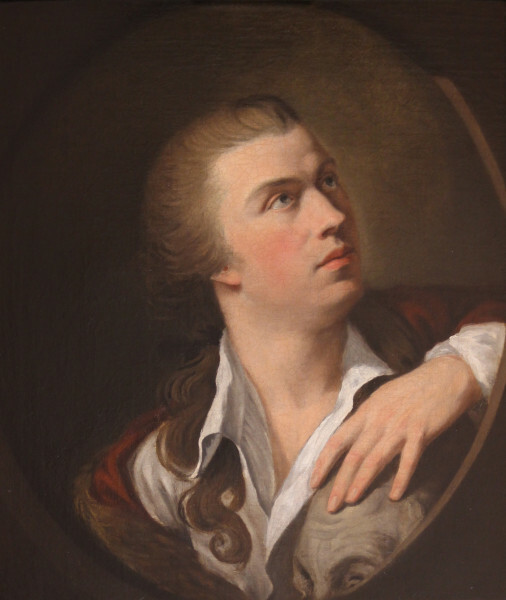 This long lived would-be poet and playwright had married a series of rich widows, the first of whose riches enabled him to buy a house in Royal Crescent Bath which became a centre of social life in Bath at the end of the 18th century. By 1790 he had built Mendip Lodge high above Upper Langford looking out over Somerset and the Severn estuary as his summer retreat. 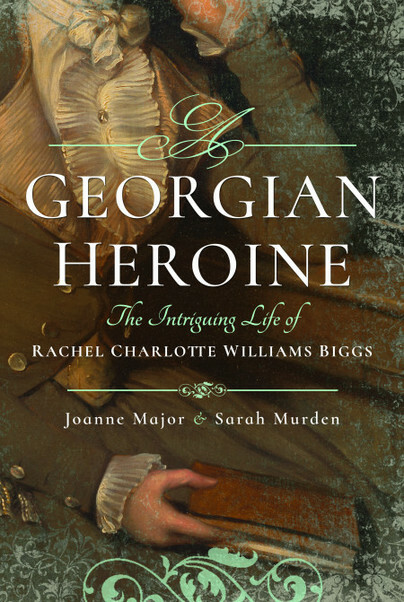 While his life in outline is known from his letters edited and published by his great nephew in 1863, research over the past 10 years has revealed a far more interesting and complete account, much coming from his extensive correspondence with his friends Mrs Thrale (Piozzi), Hannah More, Anna Seward and the actress Sarah Siddons. Sarah Siddons. Image courtesy of National Portrait Gallery. Whalley was a highly intelligent, sensitive and generous man who spent a large part of his long life and much of his wealth supporting his beautiful and talented young niece after the tragic death of her mother when she was only 8 years old. This recently published book is one of very few to detail the long of life of a sensitive and wealthy 18th century man from the correspondence of his friends both male and female. Much of Whalley’s estate, which included Dolebury Camp now in the ownership of the National Trust, is accessible to the public. 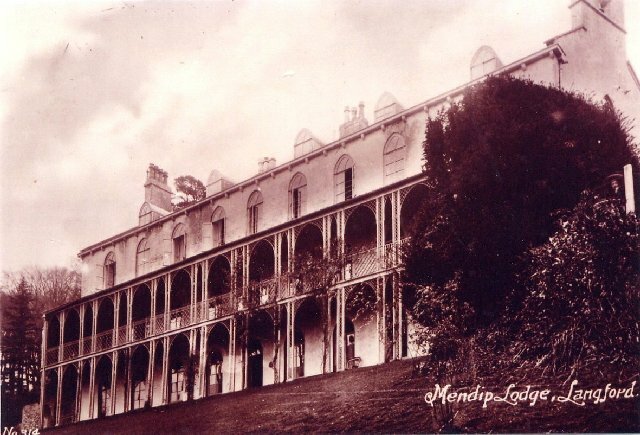 A foot path runs past the remains of Mendip Lodge which was sadly demolished in the 1950’s. Chris also appears in the new film Hannah More which is due out early next year, in the role of Rev Thomas Sedgwick Whalley.